This document counts as an agreement. By reserving a program the client automatically accepts the general conditions of Mundo Antiguo Spanish school. Mundo Antiguo Spanish school is obligated to provide the reserved program in conformity with the information that was sent before the reservation of the client. A program can consist of Spanish classes, accommodation, tours, volunteer work, internship placement, airport pick-up and any other additional service paid for by the client. If you book a 20 hour per week group course and we can´t form a group with students who have the same Spanish level, Mundo Antiguo Spanish school will change your course to a 15 hour per week private course instead. Public holidays: there are no classes on the 25th of December and the 1st of January. There are no classes on the public holidays of the 24th of June and on the 28th of July, but an alternative activity will be organized instead of the classes. Mundo Antiguo Spanish school assigns teachers and decides the timetables. Maximum group size in a Spanish group course is 4 students per teacher. Group classes can´t be postponed or changed during a program. Private classes can be postponed after the start of a program. The client needs to inform Mundo Antiguo Spanish school before 7 pm the last business day before the class, that the client wants to postpone that class. So if you want to postpone a private class that is scheduled on Thursday, you need to inform us by email before 7 pm on Wednesday. If it is a Monday class, you need to inform us at latest on Friday. All clients need to behave in a normal way and use the facilities of the accommodations in a proper way. Mundo Antiguo Spanish school can have specific rules for an accommodation shown within the accommodation that have to be respected. If you cause any damage in an accommodation due to inappropriate or irresponsible behavior, you will pay the total cost of the damage. If the client doesn´t use the accommodation in a way that is expected, Mundo Antiguo Spanish school reserves the right to cancel the program immediately. Misbehavior or use of drugs within an accommodation is a reason for cancellation. If you bring over a guest to visit, you will be responsible for all acts of that guest and you will pay for all damage that is caused by your guest. Guests are not allowed to stay for the night in any of the provided accommodations. No smoking is allowed inside the accommodations and no pets are allowed. If you are not satisfied with the accommodation, Mundo Antiguo will do its best to solve any problem, but there is no right to change or cancel accommodations. 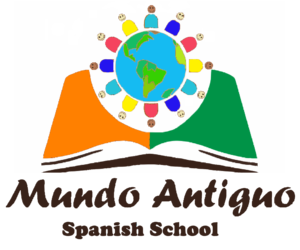 Mundo Antiguo Spanish school organizes free weekly activities. Examples of free activities can be found on our website. These examples are an indication, some free activities may be substituted by other activities. Mundo Antiguo will always try to organize at least 1 free activity per week, but if due to circumstances there are no free activities during a week, there is no right for compensation. The free services as mentioned on our website are included in our programs. We will always try to offer you all the services mentioned, but if a free service is not available during (part of) a program, there is no right for compensation. The prices of the tours mentioned on our website are always an indication and need to be confirmed by Mundo Antiguo Spanish school. Although we try to have the most up to date prices on our website, prices of tours tend to vary due to circumstances like changing regulations, lack of availability or changing entry fees or permits. In case of cancellation of a tour: the costs of reservations made by third parties (for example: transport companies, hotels or excursion to Machu Picchu) cannot be refunded. Refunds of services reserved by third parties depend on the general conditions of these third parties. Itineraries of tours can be subject to change. An airport pick-up is executed from the airport of Cusco to the accommodation of the client within the city of Cusco arranged by Mundo Antiguo Spanish school. A pick-up from the bus station in Cusco is possible on request. You need to call the phone number provided by Mundo Antiguo Spanish school upon arrival and wait for the pick-up to arrive and bring you to your accommodation in Cusco. You need to provide Mundo Antiguo Spanish school at least 48 hours prior to arrival with the correct flight details. Only then we can arrange your airport pick-up. If you do not provide the correct flight information, a change in flight schedule or when you miss your flight to Cusco causing us to wait on the airport for more than an hour or no show-up, you are obliged to pay an extra airport pick-up fee as mentioned on our price page to arrange another pick-up from the airport in Cusco to the accommodation. Mundo Antiguo Spanish school always tries to place you in the preferred organization on the preferred start date. But the organization always has the final decision in this. You always needs to respect the rules and norms of the organization where volunteering or internship takes place. Taking a day off or a holiday during the placement with an organization is only possible after permission of the organization. You need to respect the working hours and schedule as provided by the organization of the placement. If you want to leave your placement before the end of this placement, this can only be done after permission of the organization of the placement. If there can be no agreement on the termination of the contract, a termination fee of $40 can apply. When the organization where you are placed doesn´t want to continue with your placement, we will try to find you another organization to continue your placement. You must have a travel and a health insurance that covers for volunteer work or an internship placement in Peru. When the client decides to cancel his program, a possible, partial refund of the costs will depend on the decisions made by Mundo Antiguo Spanish School, based on the criteria below. If a program is cancelled 30 days or longer before the start of a program, a cancellation fee of 25% of the total cost of a program applies. If a program is cancelled less than 30 days before the start of a program, a cancellation fee of 40% of the total cost of a program applies. A cancellation of a program after the start of that program: a cancellation fee of 100% of the total cost of a program applies. If part of the program is an accommodation, a refund can be given if the accommodation lasts more than 4 weeks more, for the period after the 4 weeks. So if you cancel a program with 9 more weeks of accommodation, we can give you a refund for 9 minus 4 weeks is 5 weeks of accommodation. If more the client already paid more than the cancellation fee, the payment minus the cancellation fee can be refunded or changed into a 1 year valid credit for any of our services. Costs of the international money transfer for the refund will be paid for by the client. Refunds are only made if the refund is at least $100. Refunds smaller than $100 are automatically changed into a one year valid credit for the client for any of our services. This means you can use a refund / credit to take for example online Spanish lessons with us. Due to the special circumstances for reservations of the Inca Trail to Machu Picchu, payments for the Inca Trail have to be fulfilled completely before we can make the reservation and there is no refund possible with a cancellation and modifications are not possible. We accept written reservations to our email, together with a minimum prepayment as established by Mundo Antiguo Spanish school. You will receive all necessary payment information by email when making the reservation. The remaining amount (total cost of program minus the received prepayment) needs to be paid on the day of the start of your program in our office. After receiving the reservation and the prepayment we will send you a confirmation of the program, prove of payment and supplementary program information. The client must pay the costs of the international money transfer. Only the net amount received counts as the payment. Prepayments must be done within 2 weeks after receiving the payment information. In case that we do not receive the payment on time, we reserve the right to cancel or modify the reservation. We will notify you as soon as possible. Our prices are in USD $ (American dollars). Prices are without preceding notification variable: due to season, availability, or changes in the exchange rates of dollar or sol. At the moment of reservation all prices will be finally confirmed and cannot be changed anymore. All services as specified in the programs are included in the price. Your privacy is important to us. We won´t hand over your personal information to third parties unless necessary for the correct execution of a service. You can appear in images and videos made by Mundo Antiguo Spanish school during the program for example on our website or sharing photos on Facebook or other pages. If you don´t want to appear on images or videos, just let us know. If you don´t want to be used as a reference for people that are interested in our services, just let us know. We might use your review about the services of Mundo Antiguo Spanish school for promotional purposes. If you don´t want that, please let us know. We might use your personal data ourselves (never a third party) to send you news and information about activities during your stay at Mundo Antiguo Spanish school in Cusco and possibly occasionally for news or promotions after your stay. If you are not interested in this, please let us know. You can let us know by sending us an email with your request to info@learnspanishinperu.net and we will execute your request within one business day. The client is obligated to comply with all the indications of Mundo Antiguo Spanish School to guarantee a good program. We reject any responsibility in any case of material or personal damage due to actions, illegitimate behavior or neglect of our clients. All compensations and costs, also those claimed by third parties, would be completely paid for by the client, who furthermore will take the full responsibility for the damage caused by the client. Moreover, we reserve the right to cancel the rest of the program in extraordinary cases like illicit behavior. We will always try to help you if you experience problems. If you get ill, get in an accident, a robbery etc. we will help you. Personal attention is very important to us and you can count on our help if needed as we know how important that is when you are in another country. But if you misbehave or commit illegal actions like drug offenses or other legal problems: no help can be provided. If any offense is committed within the Spanish school, an accommodation or another service provided by Mundo Antiguo Spanish school, this will lead to direct cancellation of the rest of your program without any refund. Every client needs to respect each other and the Peruvian laws. Images, texts and videos of our services reflect a true image of the services we provide but can´t be used as a reference. You need to have the necessary visas and passports. This means all the documents that are required by the authorized authorities of the countries to be visited. In case of any doubts the client has to contact the embassy of his country in the countries he wants to visit. It is the responsibility of the client himself to correctly provide us with all his personal information, including his passport number. The client will pay the extra costs due to incorrect or incomplete information. You must have all the vaccinations and all the medicines with you that you need for a good health and you may not take any health risks before or during your journey. You must have a travel insurance and a health insurance. In case of the clients’ participation in sports or activities subscribed as ‘dangerous’, the client must have an insurance that covers these activities. These activities are for example: paragliding, rafting, mountain biking, mountaineering. We can ask the client to demonstrate his insurance before his participation in those activities. We fully reject any responsibility in case of incidents or injuries in those sports and activities; the client takes the full responsibility. In case something happens to the client (like illness or injury), Mundo Antiguo Spanish School will undertake every possible action on behalf of the clients’ safety and good health. The costs of this will be completely paid for by the client.